Billions for banks. Hardly a farthing for the families of Greece. The country continues to face impending feudalism to pacify a financial monarchy ruling Europe. Since 2010, Greece has received nearly $277 billion in bailout funds. Almost all of the money has gone to pay the country’s debts, cover credit default swaps, pay jacked up interest rates and bolster the local and international banks’ capital, rather than to provide any economic growth. Meanwhile, seniors have been robbed of pensions, minimum wage rates smashed, unemployment skyrocketed, lives ruined. First austerity package (February 2010) was expected to save $.87 Billion. It included a salary freeze of all government employees, a 10% cut in bonuses, plus cuts in overtime pay for workers, public employees and reduced work-related travel. Second austerity package (March 2010) included 30% cuts in Christmas, Easter and leave of absence bonuses, a further 12% cut in public bonuses, a 7% cut in the salaries of public and private employees, a rise of Valued Added Tax (VAT) from (by tier) 4.5% to 5%, 9% to 10% and 19% to 21%, a rise of tax on gasoline to 15%, a rise in the existing taxes on imported cars of 10%–30%. Third austerity package (May 2010) included sale of 4,000 government-owned companies, limits on “13th and 14th month” salaries, a new rise of VAT from 5% to 5.5%, from 10% to 11% and from 21% to 23% and other cuts to public employee benefits, pension reductions and additional tax increases. Fourth austerity package (June 2011) included tax hikes for those with a yearly income more than $8,720, and an extra tax for those earning more than $13,080. The government also introduced taxes on owners of immovable property (homes, etc. ), paid through the owner’s electricity bill. Fifth austerity package (October 2011) included major cuts of the wages of civil servants and slashing pensions exceeding $1,090 a month. Sixth austerity package (February 2012) included a 22% cut in the minimum wage from $818 a month to $639. Seventh austerity package (November 2012) included weakening worker rights. other market reforms and the total abolition of special 13th and 14th month salaries. Eighth austerity package (July 2013) included layoff of another 15,000 public employees – among them, school guards and city police. Ninth austerity package (May 2014) included the freeze of wages and pensions over a period of the next four years, until 2018. It also ordered cuts to the Ministry of Health, and others. Tenth austerity package (July 2015) included transfer of many products to the high rate VAT (23%) and rise of corporation tax from 26% to 29% for small companies. Much of this public debt came from banks hiking Greek public debt and then forcing up interest rates. Speculators bought up the bonds and notes. If interest rates fall, some major investors will be extra rich as those bond prices jump higher. The austerity is to prove to the financiers that Greece will pay it public debts. Like the hedge fund managers in the U.S., their short-term recipe is to cut people, cut wages, cut benefits and count pencils – and then act amazed in the long run, when sales and profits plummet. Impoverishing the citizens to pay very high interest rates to bond speculators is the recipe for Greece, according to German and other worldwide bankers and their cronies. 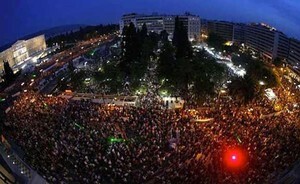 The result is a 25% drop in GDP, 20% unemployment, beggars in the streets of Athens and a 40% jump in suicides. This is what the US has to fear moving forward to globalization and the World Bank and IMF. That we can stand by and see banks destroy sovereign nations only means other countries will remain silent when our turn comes. We need to tax investment transactions and put the money to retiring some of this debt.